With the voice over, that counts the beat of Salsa, you will be able to concentrate more on the steps, and you will have a guide leading you throughout the song. The structure of this CD allows the listener to build a basic understanding of timing, whether dancing on 1 or on 2, while building up dancing speed. By the end of this CD you should be able to count the music on your own and dance at the speed of the CD preparing you for nightclub dancing. 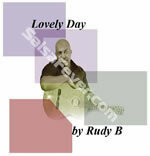 Bringing Salsa to mainstream, Rudy B's debut single Lovely Day, a salsa/RnB remix of the legendary classic by Bill Withers. Salsa Rhythm & Timing Instructional CD - A great way to practice your salsa steps whilst you perfect your timing. Includes 21 lessons.